I've been meaning to write up the DIY tutorial for our playroom chalkboard fireplace cover for, oh, months, and am finally getting around to it! If you've been bouncing into my DM's asking for tips and step by steps, I am so sorry that I've kept you waiting so long. 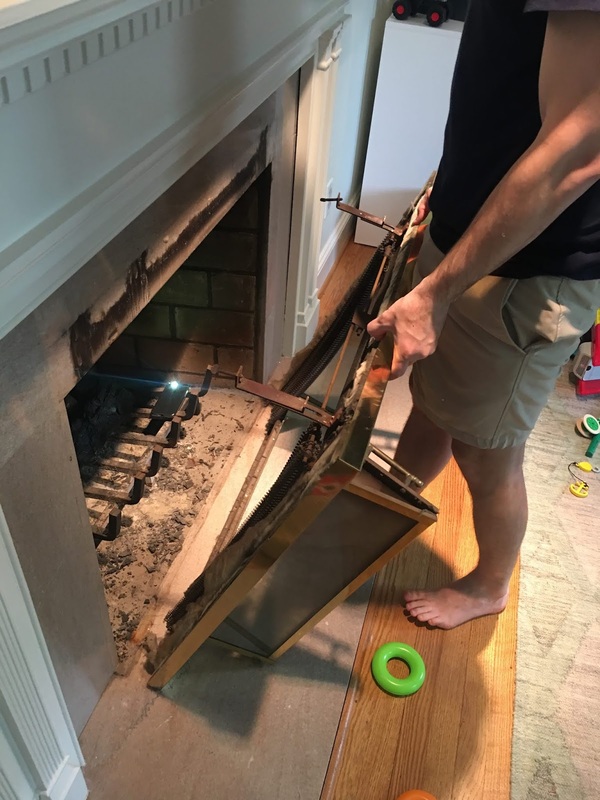 I promise this little project is insanely easy and solves a multitude of sins - a drafty fireplace, kiddo proofing from an open fireplace, replacing a dangerous glass fireplace cover (our reason! ), adding a pop of color and personality to a traditional element, you name, this inexpensive fix has it covered. When we opted to turn our formal living room into the playroom, we knew the fireplace cover would be something we would need to address. The folding glass accordion doors were just begging for tiny fingers to pinch and once open, the glass had incredibly sharp edges. I also didn't love the dated style, so it had to go. Because we had never removed a fire place screen/door install before, I had no idea how easy it was - I can promise I'll never live with an ugly fireplace screen again! 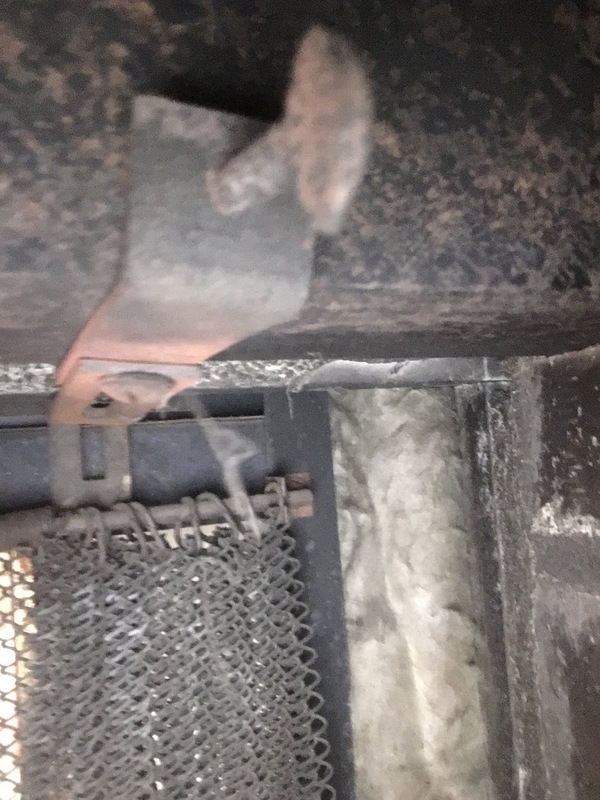 If you look inside your fireplace, there are large bracket screws at the top corners of the fireplace opening that are securing the door. Simply unscrew to remove the screen unit. Ours were rusty and took a bit of leverage but otherwise, it's an insanely easy process. Measure the space that you want to cover with the plywood. I left a one inch border of "wiggle room" to prevent the plywood from scratching our wood mantle surround, just in case we need to sell this house in a flash (as we're known to do). Lowe's or Home Depot sell sheets of plywood and cut them for free to your measurements. Just ensure that your piece doesn't have any bend or curve to it. I used three cans of cobalt blue chalkboard spray paint for solid and even coverage. Allow to thoroughly dry before handling or bringing indoors - I let mine sit for 24 hours. Because we have a marble tile surround and we are always thinking about re-sale, I wanted to attach the cover with as temporary a solution as possible. If you have a wood trim, you could include the trim in your measurements and attach directly to the trim with wood screws. To maintain the marble, I cut and attached two velcro strips to each corner of the fireplace, for a total of 8 strips. Following the package directions, I then attached the backing of the strips to the plywood and pushed the board into place. I propped something heavy against it to encourage the strips to secure for 24 hours. We use our fireplace cover as a backdrop for our playhouse and the kids love getting to color on the bright blue cover. It adds so much personality to our playroom and I'm so glad that we don't have to worry about the original glass cover. P.S. you can also make this project magnetic! Just add the magnetic primer to your paint process!